Dermarolling / Microneedling / Corn remover for collagen lumps? Thank you Soon, I think you are right. Milia got into my mind too but I got confused when reading that corticoid was used to dissolve the nodule on the shoulder so I wanted to suggest a visit to a dermatologist. But it seems they really are milia. Do I understand it well - you needled for two years and you have had those lumps since? Apart from the lump that formed on your shoulder after an injury, have you ever got them? Do you have any keloid scars? The difference between a keloid and a hypertrophic scar is that a hypertrophic scar is raised but it is more or less within the boundaries of the original injury. Keoloid scars totally outgrow the original boundaries of the injury and they grow to all directions. Do you get scars even from tiny injuries such as a bug bite? Dermarolling / Microneedling / Is vitamin c serum supposed to be watery? Yes it is watery and it tastes acidic, you can try it. Apply it with a cotton pad or just with your hands. I am not sure what you mean by collagen lumps. There can be some skin "bumps" after needling but nothing permanent. Have they appeared every time you needled? Have they disappeared? Are they painful to the touch? >my first question is about cleaning the dermaroller. >On the instruction site it is said, to NOT clean the dermaroller with higher than 30% isopropanol. >What I get here from the pharmacy is 70% isopropanol (also called rubbing alcohol here) does that >mean I should DILUTE this by half with water? Two customers reported soaking their roller in a high percentage of isopropanol and the dermaroller "disintegrated", according to them. On the other hand we have customers who also soaked it in a high percentage of isopropanol and there were no problems. Nonetheless I must warn our customers. We are not sure whether it is a problem with a specific brand of isopropanol or whether there was any real problem at all. You could dilute your isopropanol with water to half its original concentration and add ethanol to make it more effective. We sell Chloramine-T for dermaroller disinfection. That is currently our recommended method of microneedling instrument sterilization. You could also use that (2% solution) on your face, but it will smell strongly of chlorine for hours..
Dermarolling / Microneedling / Help please... feeling sick re: type of needle used! Lancet needles are shaped to easily cut a slit into the skin - their purpose is to cut the very tough skin of the finger to draw blood for glucose monitoring. This shape is unsuitable for subtle microneedling but if you only did it once and not aggressively, your skin will not suffer permanent damage. If you end up with excessive skin after weight loss, give your body some time to accommodate to its new shape and do your best to build up muscles. If still left with sagging skin, there is no other way to fix this than plastic surgery that will cut off the excessive skin (hopefully including some stretch marks). You can certainly dermaroll stretchmarks when in the process of losing weight. There are studies concerning the role of vitamins and other substances or even massage therapy etc. in the prevention of stretch marks but none of them were successful in finding an effective stretch mark prevention. The best stretch marks prevention I can recommend is not to significantly gain weight or fluctuate in weight and not to use oral or external corticoids unless it is totally unavoidable. The stretch marks of the "photo-customer" you mentioned still do have indentations. The biggest improvement in her case is that the texture of her stretch marks is smoother and their color darkened - they are much more blended with the surrounding skin and that makes them almost invisible. Dermarolling / Microneedling / Will dermarolling affect tattoos? The extremely slow turnover of the cells in the dermis is on the reasons why a tattoo in the deep dermis (1 mm or deeper) lasts a lifetime. Tattoos slightly lighten over the years but the pigment stays for many, many years. Permanent make-up is not inserted as deep so it lasts long but not as long as a tattoo. However when the dermis is injured, our body has to repair the damage and thus the dermis is partially or fully renewed. If it is a serious injury, our body unfortunately quickly fixes it with scar tissue to protect us from infection etc. Dermarolling causes microinjuries. They are not so serious to cause scars, nevertheless they do trigger healing and regeneration responses in the skin. Dermarolling with needles that reach the dermis trigger partial renewal of the dermis. This can theoretically speed up the fading of a tattoo if the needles reach the tattoo. You can dermaroll the whole area immediately after needling or stamping or do it later, it depends what is easier for you. It can be painful to roll over the needled scars so rolling some days later is perhaps easier. Loofah is not strong enough to unclog/unplug the pores, you should use pumice and experiment with frequency of using it and pressure applied on it. Your skin has to get used to it, do not give up if the initial reaction of your skin is irritation. I think you should first try to get the "zits" under control by constantly unplugging them by the pumice to prevent their clogging and only then use a dermaroller. Dermarolling / Microneedling / What size dermaroller for different scars? You should use a single needle on all your scars every 3-4 weeks. If they are large, use a dermastamp. Since your scars are not deep but hypopigmented or raised, use a 0.5 mm dermaroller and roll twice a week. Yes, you can needle and roll at the same time. Yes, it is OK to use a dermaroller in combination with the silicone sheets. You have actually very good looking skin with really minor imperfections. Once in 3-4 weeks, use a dermastamp on your round-shaped scars and needle the long scar with the single needle. Then roll all over your cheeks with the 1.5 mm roller. For the pigmentation, use the 0.5 mm roller twice a week. 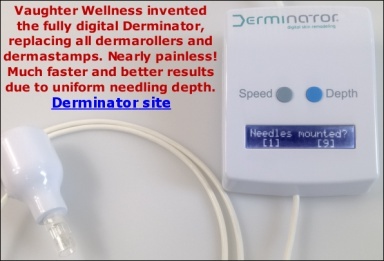 A one-liner dermaroller is not suitable for your type of scars, except for the stretch mark. The A-Ret cannot be truly replaced by Infadolan as they contain different type of vit. A. Nonetheless, needling is effective for stretch marks even without the A-Ret. If you bought Infadolan, apply it after needling your stretch mark. Do not needle deeply on the nose. You can replace the single needle with a dermastamp but the same rule applies. Start slowly and never dermastamp aggressively. Aznskn to be honest I do not know what is the best general dermarolling approach to reduce pores because our customers who succeeded in improving pores have mostly used different methods. Perhaps you can try the same method as Soon and Finley (thank you both very much for your feedback). Always do a test patch first because your pores may react differently. I still think that your beautiful skin doesn't need any improvement because in real life your pores are basically invisible. Using a 1.5 mm dermastamp is very efficient for acne scars.